What is the ithlete Team App? Heart rate variability (HRV) is an objective method for assessing the effects of stress on your body, making it the most accurate fatigue and recovery metric available. It is measured as the time gap between your heart beats that varies as you breathe in and out. Research evidence increasingly links high HRV to good health and a high level of fitness, whilst decreased HRV is linked to stress, fatigue and even burnout. Professional athletes and teams have been monitoring HRV for decades; however until recently this was hugely expensive, time consuming and challenging to use. 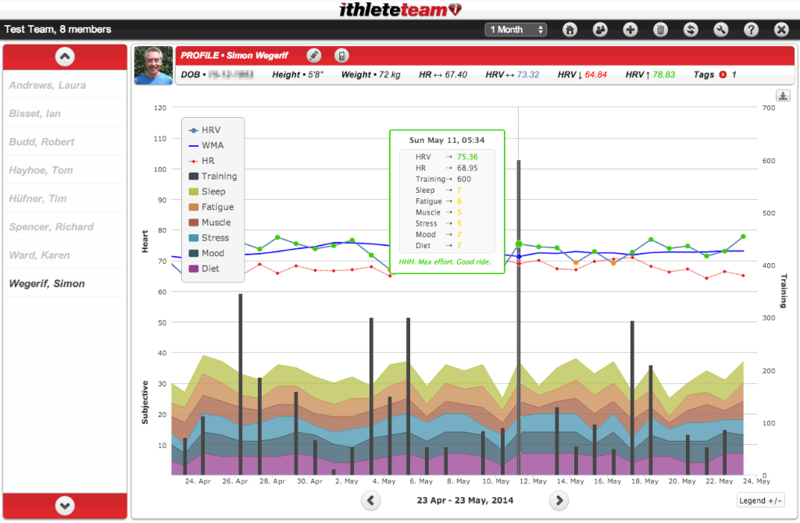 Daily monitoring also maximises training efficiency, predicts oncoming illness and tracks progress over time. But how can you really apply this in a team setting? In response to huge demand we are pleased to announce the launch of the ithlete Team App. The ithlete team app allows coaches to automate the collection of player’s daily HRV data and review collectively to inform training and competition decisions. The ithlete Team App has been created around the feedback and comments of professional coaches, team doctors and individual athletes to develop a system which provides significant value whilst fitting seamlessly in to daily routines. How does the ithlete Team App work? Available from any web browser on a PC, Mac or tablet the ithlete Team App allows coaches to manage players HRV data centrally. Players take a morning ithlete measurement on their smart phone, tablet or iPod and once synced (the first time used only) data is automatically uploaded in to the ithlete Team App. For more details on players morning measurements please see our How to use ithlete page. 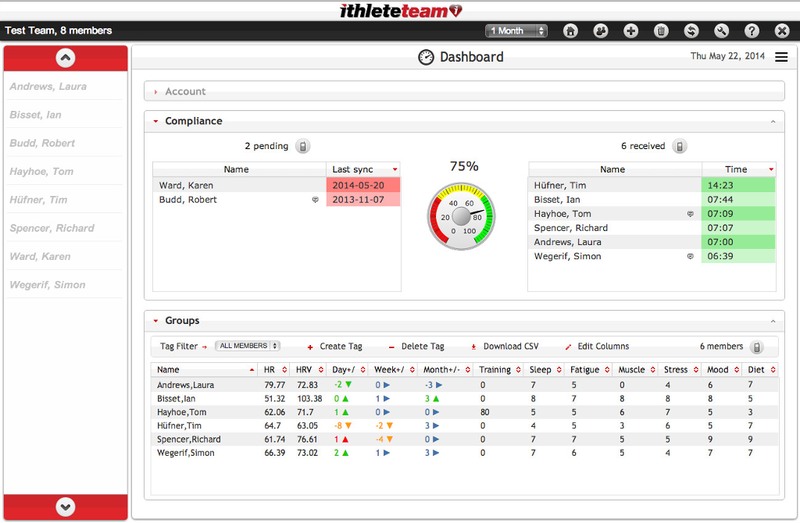 The ithlete Team App dashboard provides coaches with a snapshot of player stats. The top level will give a percentage of players who have uploaded a measurement that day – great for knowing who to remind too. The coach can then look in a little more detail, listing daily recommendation, HR, HRV, HRV change, sleep and training load. Want to see who is most recovered and ready for training or competition? Easy, sort by daily recommendation. Concerned players might be experiencing jet lag? Sort by sleep score. Sorting by position is another great feature – making team selection and comparison much easier. All of this information can be manipulated to provide the view you need. Furthermore clicking on any players name will take you straight to their individual profile to analyse their data in more depth! Monitoring players with ithlete facilitates the collection of HRV, heart rate, training load, self-rated sleep score and any comments. 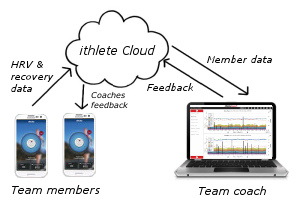 Daily measurements are automatically uploaded from the player’s mobile device to the ithlete Team System where the coach can view, interrogate and respond to the data. After a week athletes build up a personal HRV baseline, significant deviation from baseline is an accurate picture of their current level of fitness, recovery from previous workouts and readiness to train. The ithlete Team App uses the traditional ithlete colour coding scale to ensure coaches can see player’s daily state at a glance and tailor planned training accordingly. This not only prevents overtraining but also maximises training efficiency by allocating appropriate loads and programmes the athlete can handle on any given day. Regardless of the sport or level, players are a valuable asset. Coaches have to manage various demands whether it is keeping a small squad of players fit throughout a season or balancing demands of elite players across multiple competitions. The ithlete Team App will allow you to record and monitor players HRV and training load throughout the season identifying and responding quickly to trends. If a player is getting fatigued after a long run of games ithlete will quickly identify this before any other symptoms are present allowing coaches to incorporate additional rest and recovery time in to the programme. Variable time view on the graph allows you to analyse 1, 3, 6 or 12 months data at any time before zooming in on a user defined period. 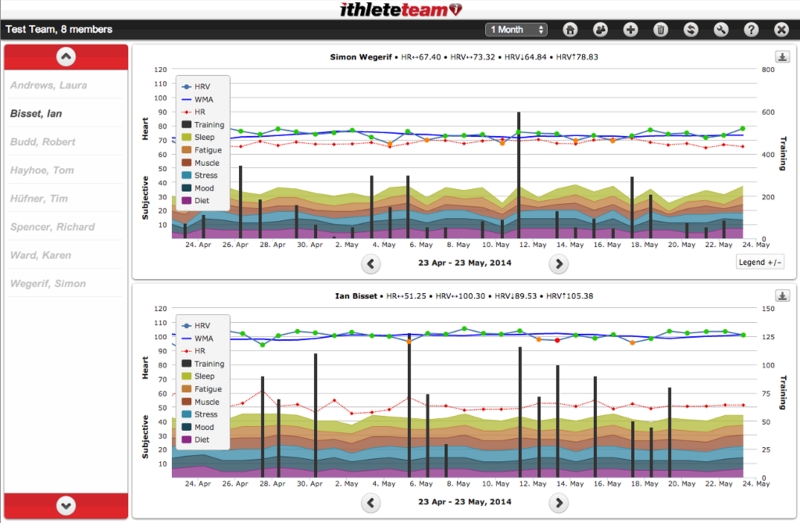 The split mode displays data for multiple players, allowing comparison of how different players are responding at various times in the season. This is often used to analyse how fit players are ahead of competition – just imagine a tool to reliably tell you which of your forwards/wingers/etc. is at their fittest ahead of a big game. Another way the split screen mode can be used is to review a player’s progression across two periods, for example, comparison against last month/season. The example below shows how a player’s training load, HRV and weekly moving average HRV have changed across the three months pre and post-Christmas break. This feature can also assist coaches in analysing the physiological impact of training and competition on any given player or a whole team. Analysing responses and amending training will help ensure sufficient preparation for competition. International duty is frequently a topic of conversation and controversy for players and managers alike. How does it impact the regular season? Do players who benefit from additional rest weeks have a significant advantage? How can coaches balance the demands without risking player’s fitness and wellbeing? Players can take their ithlete HRV measurement from anywhere and so long as they have their mobile phone and internet connection data is automatically sent straight back to their coach. This enables the coach to identify concerns whilst the player is away from the squad and be prepared upon their return. It is well known that chemical, emotional and physical stress all have a significant impact on the body’s ability to perform. Measuring HRV with ithlete takes account of cumulative stress and allows players to enter a sleep score and any additional comments. Coaches can view this information by hovering over any data point on the players chart within the ithlete Team App. Interested in the ithlete Team App? I am interested in more info I am a strength coach and would like to know more. Hi Jeff, could you drop us an email to discuss please? what is the easiest way? Do I need the Team application? I would love to use with my second semester Ex. Phys Class. I have dropped you an email to arrange a good time to call.